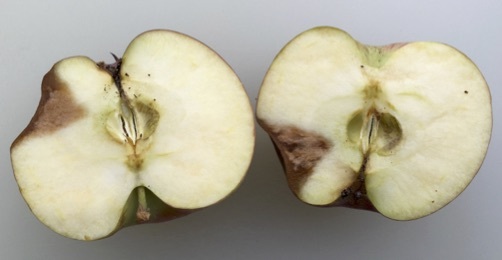 Bitter rot is a common fruit rotting disease of apple (and pear) that occurs in all states where apples and pears are grown (Figure 1). Bitter rot is caused by the fungi, Colletotrichum gloeosporiodes, C. acutatum and Glomerella cingulata. Colletotrichum gloeosporioides and C. acutatum are the same pathogenic fungi that cause anthracnose fruit rot on strawberry and blueberry, ripe rot on grape and anthracnose disease on peach. Glomerella cingulata can also cause a leaf spot and canker on apple, although these forms of the disease are not common in Ohio. Figure 1. 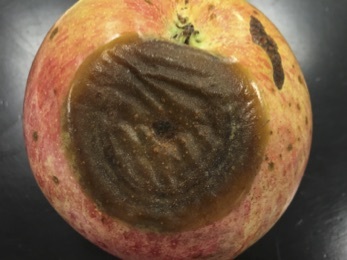 Bitter rot on apple fruit. Disease development is favored by high temperatures (80–90 degrees F) and high relative humidity (80–100%). The fungi survive the winter in dead wood or mummified fruit that were infected during the previous season. In the spring, spores (conidia and/or ascospores) from these overwintering sites serve as the primary inoculum source for new infections. Conidia are spread by splashing and wind-blown rain, insects and birds while ascospores are released into the air during rainy periods. Fruits are susceptible to infections from petal fall through harvest. Symptoms first appear as small, slightly sunken circular areas that are light to dark brown in color. On mature fruit these areas may be surrounded by a red halo. When environmental conditions are optimal, the spots can enlarge rapidly and cover the entire fruit surface. As the spots enlarge, the fruit rot symptoms can vary depending on the fungal isolate and the type of spore that initiates infection. Spots initiated by isolates that only produce conidia (referred to as conidial isolates) are sunken and circular with concentric rings. Within the rings, copious amounts of conidia are produced in fruiting bodies called acervuli (Figure 2—Top). Under moist, humid conditions, the spore masses appear creamy and are salmon to pink in color. Spots initiated by isolates that produce conidia and ascospores (referred to as perithecial isolates) are usually not sunken and are darker brown in color than spots produced by conidial isolates (Figure 2—Bottom). Within the spots, structures that contain ascospores (perithecia) form in black clumps over the surface. As spots enlarge, the rot progresses inward towards the core. 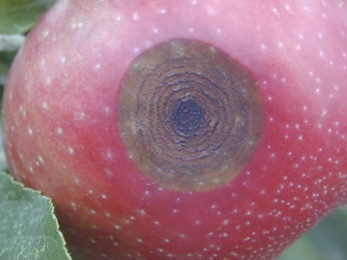 After making a cross-section of the infected fruit a V-shaped, brown watery lesion can be observed (Figure 3). This is a key diagnostic feature of bitter rot, which distinguishes it from other summer fruit rots (i.e. white rot and black rot). Leaf lesions and cankers are uncommon in Ohio. Leaf lesions begin as small, red flecks, which enlarge to irregular brown spots that are 1/16 to 1/2 inch in diameter. Severely affected leaves may drop off the tree. Cankers are oval, sunken, and often marked with zones (zonate). Figure 2. 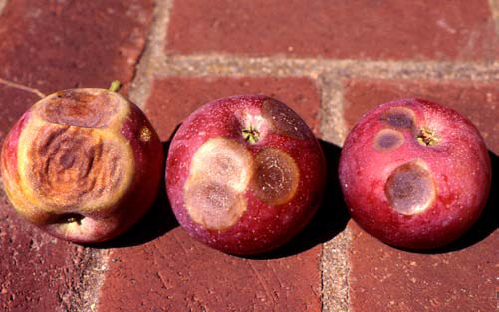 Close-ups of bitter rot on apple fruit. Top—Sunken lesion containing concentric rings of acervuli. Photo courtesy of Jon Clements, UMass Amherst. Bottom—Dark circular lesion with brown acervuli scattered on the surface. Bitter rot can be successfully managed by integrating good sanitation practices, cultural practices and chemical control. There are no varieties that are resistant to bitter rot. Bitter rot control is dependent on good orchard and tree sanitation. Dead wood, including shoots infected with fire blight, is an important source of inoculum and should be removed from the orchard and burned. Chopping dead wood on the ground with a flail-type mower will remove most of the bark and increase the rate of decomposition. Removing and burning mummified fruit from trees throughout the growing season will reduce inoculum levels during the current and following season. Any practice that helps to maintain trees in a healthy vigorous condition is critical for controlling the canker phase of bitter rot disease. Cankers generally develop only on stressed or weakened trees, especially winter-injured trees. Prune trees annually and maintain a balanced fertility program based on soil and foliar nutrient analyses. Figure 3. Cross section of bitter rot infected fruit. Note the V-shaped lesion. This characteristic distinguishes bitter rot from white rot and black rot. Fungicides applied from first cover until harvest are effective at controlling fruit rot if a good sanitation program is implemented. Fungicides are not effective for controlling the canker phase of the disease on weakened trees. For the most current fungicide recommendations, commercial growers are referred to the Midwest Fruit Pest Management Guide (previously Bulletin 780). Backyard growers are referred to Bulletin 780, Controlling Diseases and Insects in Home Fruit Plantings, which is available from your county Extension office or the CFAES Publications online bookstore at estore.osu-extension.org.